When the surgery is shut there are in place arrangements to provide advice or help for patients in urgent need. 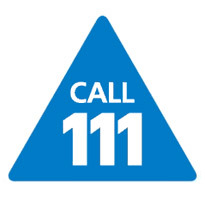 Any patient in urgent need of help out of hours should phone 111 where a nurse will give advice or maybe book an appointment either at the Canford Heath dental clinic or at Dorchester hospital. These clinics are by appointment only and are funded by N.H.S. England. And of course you can book a "checkup" online, even if we are closed! We are open six days a week from 9 in the morning, and have some late evenings when we stay open till 8pm.